Edlesborough is a village within Aylesbury Vale district in Buckinghamshire, England. 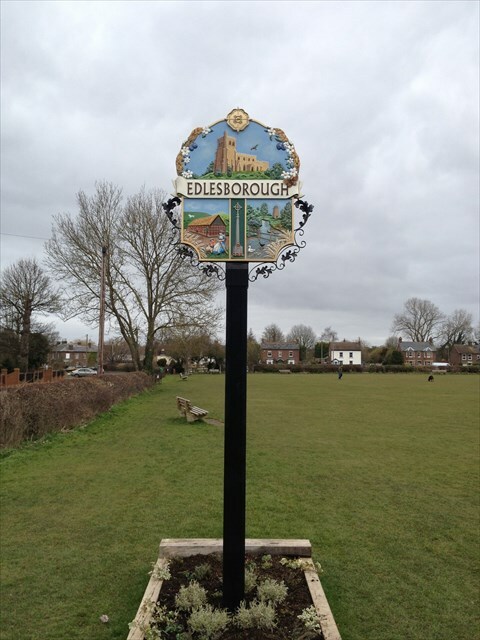 It is within the civil parish of Edlesborough Northall and Dagnall. The village name is Anglo Saxon in origin, and means 'Eadwulf's barrow'. It was listed in the Domesday Book of 1086 as Eddinberge. The village was once a centre for the straw plait industry. "RAF Edlesborough" was a radio station near Dagnall. The cache is a camo'd clip lock cache hidden close by! On with the walk! Stage 1 at N 51° 52.016 W 000° 35.151 Looking at the church on the opposite side of the road to the sign, what date was it constructed? Take the first number from the second this gives you B. Stage 2 walk down the road towards the village to N 51° 52.075 W 000° 35.082 (careful as you cross the road!) you'll see a green box. What is the number on the box? This gives you E.
Stage 3 walking further down the road towards the village to N 51° 52.132 W 000° 35.078 (careful as you cross the road again!) you'll see a yellow hydrant upon which are two numbers. Add the two numbers together. This gives you F.
Stage 4 Turning up Waterside to N 51° 52.129 W 000° 35.014 (careful as you cross the road for the last time promise!) you'll see a sign for residents only parking. At the bottom of said sign are two instructions (on a red background) made up of two words each. First take the number of letters in the first word of each instruction and take them away from each other this gives you A. Then repeat with the second two words this gives you C.
Stage 5 walking down the road to the foot path by the river Ouzel at N 51° 52.128 W 000° 34.972 you'll see a green notice board. At the top you'll see 4 words, add the number of letters in the first word to the number of letters in the second. This gives you D.
Please return the cache as you found it. Happy caching!